Pizza is a fun family meal to enjoy all year round. But if you are trying as much as possible to eat seasonally, from your polytunnel, then you may wonder what to use on pizzas before any tomatoes are ready. Of course, you may have tomato sauce stored from the previous year’s harvest, but it is also possible to think beyond the classic tomato cheese combo when thinking pizza toppings for spring. Below are five different pizza topping ideas you may like to try. 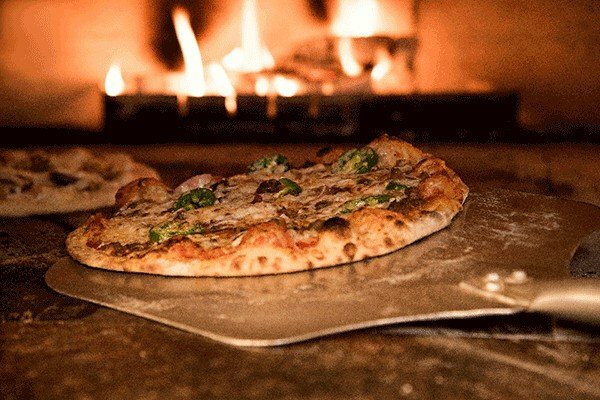 You might also want to consider creating your own DIY pizza oven to cook them in. What could be better than pizza made from scratch, using ingredients you have grown yourself, cooked in your own home-made oven?! A delicious pesto is one of the best ways to make a range of pizzas without tomato sauce. Simply blend up herbs such as basil with garlic (to taste), olive oil, pine nuts or sunflower seeds or similar and salt and pepper then spread on your pizza. Top with creamy ricotta and spinach or other spring greens. Use a cashew cream mix rather than ricotta for a vegan alternative. Another pesto idea blends fennel or dill with lemon, olive oil and seasoning to taste. This could be lovely with smoked salmon or, if you are vegetarian, with a simple mix of spring onions, mange tout and other fresh spring greens. Another simple, family-friendly pizza topping idea is all about the simple, earthy flavour of broad beans. Blending beans into a hummus means that they can be used in a wide range of different recipes – a pizza is one of the simplest. By experimenting with spices you could also add interest while keeping this a healthy, vegan, cheese-free pizza recipe. Of course, this also lends itself to a cheesy option too. Another simple tomato-free pizza that kids will love is one that uses a pea puree in place of the usual tomato sauce base. Peas and cheddar cheese can be lovely on their own, but of course, you could also add a wide range of other seasonal veggies. Pizza dough can also make a great base for a decadent veggie feast, with thinly sliced beetroot, carrot, cabbage or kale and garlic, all drizzled in olive oil. You’ll be amazed by how sweet this topping can be, especially when you use your own crops, pulled that day from your polytunnel! For added sweetness, you can also drizzle over a little honey, which brings out the earthy flavours to perfection. Do you have other favourite pizza topping ideas for spring polytunnel produce? Let us know in the comments below.